Editor&apos;s Note: Sadly since this article was published, The Artisan Marketplace closed. 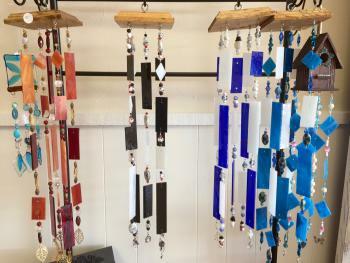 We have some amazingly talented artists in Hendricks County, and a relatively new place to browse and purchase all sorts of arts, crafts, home decor, handmade jewelry, homemade clothing and much more is The Artisan Marketplace in Plainfield. On one of our fine spring days that we&apos;re experiencing in this very odd February, I wandered in to The Artisan Marketplace, located at 120 E. Main St. in Plainfield (the northwest corner of East and Main streets) and had the opportunity to visit with the shop owner Molly Hammond. Molly, who teaches art classes next door, opened this unique and creative gift shop in October because she knew many skilled artists who had no way to display and sell their work. Her store is now stocked with a wide array of really neat items that are handcrafted and homemade by local people. Inside The Artisan Marketplace, you&apos;ll find wall art, photographs, jewelry, knitted sweaters for children, kitchen items, towels, quilts and so much more. 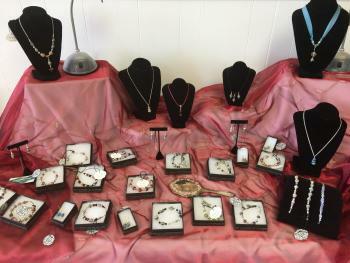 Items move quickly, so the selection is constantly changing, making it an ideal place to shop frequently for beautiful and unique gifts for yourself or someone else. You&apos;ll find a wide range of prices in the store, which means gift-seekers of any budget can find a unique item to purchase. Molly even opted to use the word "marketplace" rather than "gallery" in the store&apos;s name because she feels the word "gallery" might give people the wrong impression that everything in there costs thousands of dollars. Instead, she wants her store to be a welcoming place where everyone feels comfortable looking around and finding something they love at an affordable price. Molly is extremely well-versed in her entire inventory, and I really enjoyed learning about what a positive impact The Artisan Marketplace has had on many local artists. 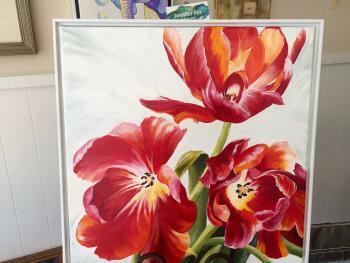 For example, she told me about one artist who had been an accomplished woodworker until he suffered a stroke. His tools then collected dust for quite some time until Molly opened her shop. The opportunity to have his work in front of the public inspired him to return to his workshop and begin crafting amazing creations again. Not only did this man recovering from a stroke earn a tidy sum of money over the holidays, his woodwork gives him a renewed sense of purpose and aids in his recovery. As we walked through the shop together, Molly told me all sorts of stories about the people who created various pieces, how the pieces were made and other pieces the artist has made. It&apos;s really fascinating to learn about these artists, and it adds to the value of the piece when you know a little history behind it. An abundance of free public parking surrounds The Artisan Marketplace, so it&apos;s easy to get to and adds to the quaint feeling of the historic Plainfield Town Center. Molly said she would love to see her area of town develop into something along the lines of the Hendricks County Courthouse Square in Danville, where several locally-owned stores, restaurants and other establishments attract shoppers and visitors from all over. With the Oasis Diner on one end, Sal&apos;s Famous Pizzeria on the other end and several locally-owned shops such as Gear Up Cyclery, Nomad Yarns and now The Artisan Marketplace in between, the historic Plainfield Town Center is well on its way to Molly&apos;s dream and definitely worth exploring. On my way out of the store, one piece in particular caught my eye, and I just couldn&apos;t leave without purchasing it. As Molly wrapped it up for me in colorful tissue paper and put it in a handled bag, she excitedly said, "This was made by the man I was telling you about who had the stroke! He&apos;ll be so thrilled to hear that you purchased this!" Cue the warm fuzzies. I walked out of The Artisan Marketplace with a unique piece of art and a big smile on my face, thinking of the man who created it. You should give it a try. It feels awesome. Extended spring hours coming soon!